Log home chinking can be done during construction or years later to keep the interior warm and airtight. 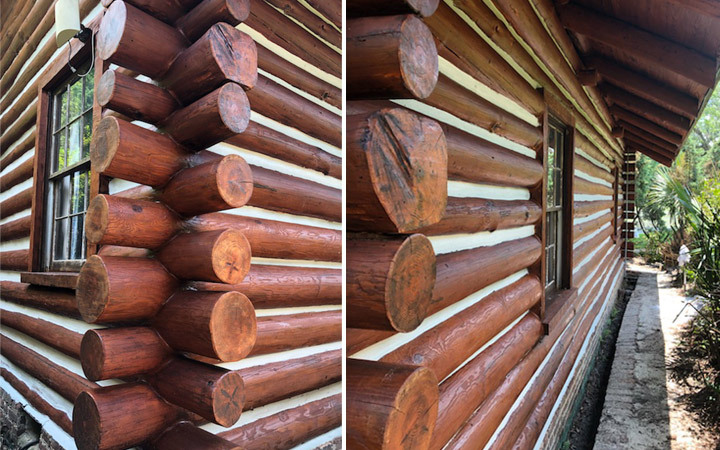 Chinking conserves energy and protects your log home from insects and log decay. Modern acrylic chinking is long lasting and involves little maintenance. Applied properly, Chinking can enhance the comfort, preservation, and resale value of your home. Performance Log Finishers is authorized as an applicator by leading chinking suppliers and uses advanced chinking materials to seal the open gaps between logs to eliminate heat loss and air infiltration. Advanced acrylic chinking adheres to logs and stretches to maintain a tight seal by following log movement. Log Preparation: Log surfaces must be clean, dry and free of foreign material. If needed low-pressure washing or Media blasting may have to be done first. Very hot weather and high humidity or very cold weather can impact application of chinking. Two Point Adhesion is required to maintain a seal while retaining the ability to stretch and contract with log movement. Chinking and sealant products must be applied in a manner that allows good adhesion to the two wood surfaces. This may require the use of backing materials. To maintain a good seal and allow log movement you must create an adequate sealant reservoir. The larger the sealant joint width, the less likely log movement will exceed the sealant’s capabilities. Elastomeric sealants can blister when applied over an inappropriate surface such as certain previously applied sealants, improper backing materials or a hot surface. Selecting the correct backing material is critical for proper performance. Only the highest quality tools are used to chink your log home. Grip Strip and Backer Rod in various sizes for all types of log styles. Hot knives and blades for cutting expanded polystyrene (EPS) board. Large and small applicator bags. Manual and air powered bulk loading guns and accessories. Powered chink machines for large jobs. A wide range of trowels, spatulas and brushes. Chinking is time-consuming and requires expertise to apply correctly. The experienced Performance Log Finishers team members say chinking can be one of the most important tactics for protecting log homes. Contact Performance Log Finishers to learn more about chinking your home by calling 800-781-2551 today.